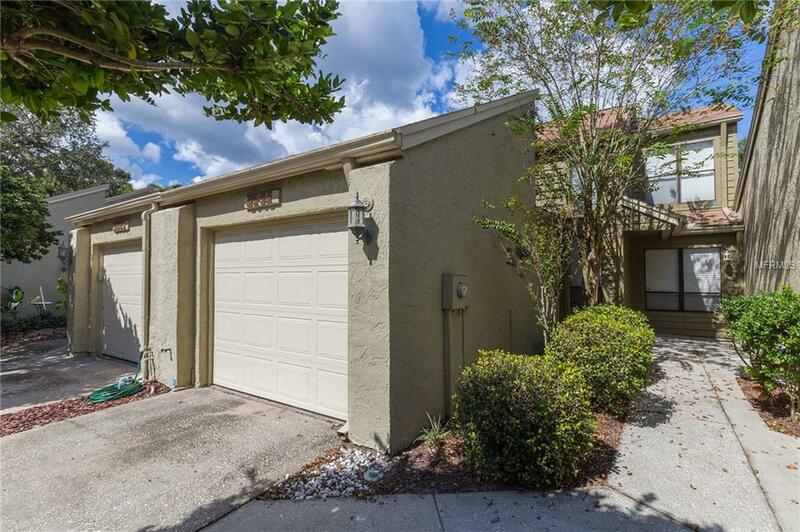 This beautiful and spacious 2 BRM, 2 BA, 1 car garage town home is located in the exclusive Carrollwood community of the Galleria. This quiet neighborhood is tucked away from the hustle and bustle but yet close to everything. On the first floor is the spacious living/family room with a cozy wood burning fireplace, laminate floors, and large plate glass windows that allows the natural sunlight to shine through. The breakfast bar & dining area transition nicely into the living/dining room and the high ceilings & open layout makes it a great entertaining space. Sliding glass doors open up to create even more living space with the screened, tiled & covered patio. The kitchen is complete with all the necessary appliances, including a newer Bosch dishwasher and a Whirpool fridge. The second bedroom and adjoining bathroom are conveniently located on the first floor. Inside utility room with washer, dryer and built-in cabinets is also conveniently located on the first floor. The second floor is the master suite with a small balcony overlooking the first floor living area. The master suite includes a large walk-in closet offering lots of storage and a huge updated bathroom with a walk-in shower. This townhome has been very well maintained. A great resort style community pool w/ cabana area offers additional entertaining opportunities. The Galleria is a much sought after community that is centrally located to shops, restaurants, major highways, arenas and other Bay area hotspots.